Simon was a puppy mill dog. That means that he spent his entire life in a cramped cage, only taken out to breed. He was taken to the humane society when the mill was shut down by athorities. He is around 3 years old. 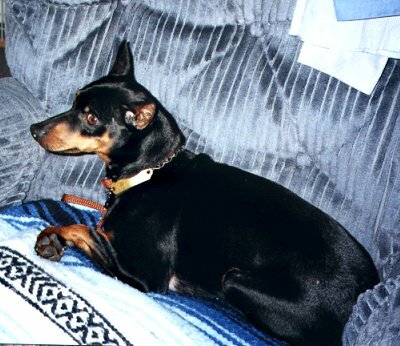 He was rescued by Sue of IMPS (Internet Miniature Pinscher Service) the Thursday before Christmas 2000. She was on her way out of town to the eastern part of the country. She brought him to us in Kentucky, where he spent such a short time, but will always be remembered as our special Christmas guest. The other dogs stockings were hung by the chimney with care....but poor Simon didn't have a stocking. So, we made him one out of a bag and he got goodies like stuffed animals, and treats. We could tell that he hadn't known human touch before or if he had been touched, he had been abused. He was very afraid of everyone. All the excitement of Christmas, didn't help, but he made it through like a real trooper. He didn't know how to climb stairs, so taking him up for his first bath was a real treat, but we had to get the awful puppy mill smell off of him the best we could. He had to be carried up and down the stairs. On Christmas morning, as we opened gifts, we perched him on the sofa, where he stayed because he didn't know how to jump down. See his little head peeking above the box? He was a wonderful guest. 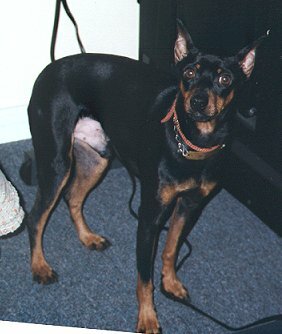 A beautiful dog with beautiful markings and shiney black coat, but frightened like a wild deer, Simon would cower in the nearest corner when given the chance. He quickly learned to, on his own, gently creep over to us for a treat. We could see that his trust was slowly building. 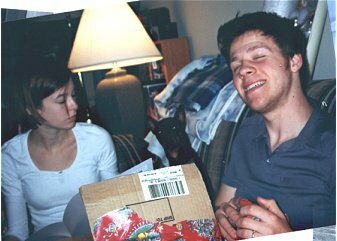 The day after Christmas, we said goodbye to Simon. He spent a few days with Kristin in Indiana, but was on his way to, Ohio to stay with Pam of IMPS, until he would find a permanent home. Only after a couple of days, Pam could see the progress that Simon was making. 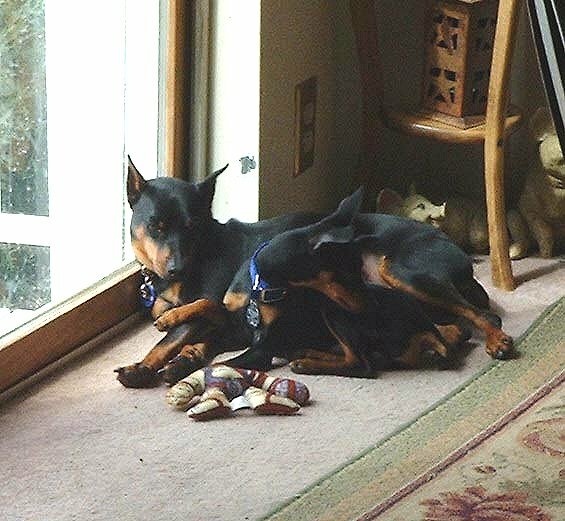 He stayed on the sofa under covers with her other babies and with her. He learned to go in and out the pet door with the other puppies. "Simon actually got on the sofa last night with me.....got under the blankies with the other 3.....this is a big step for him. He also is going to Pam and Geraldines, two wonderful women who are new Indiana volunteers. 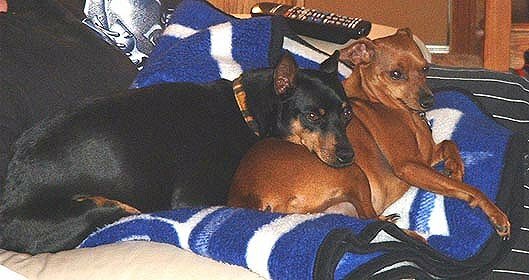 They own their own business and work at home and have a minpin and two other dogs. They are wonderfully compassionate and caring people who I believe can give him the love and build trust and confidence with one so neglected in the past. I am just so happy this home is coming his way. 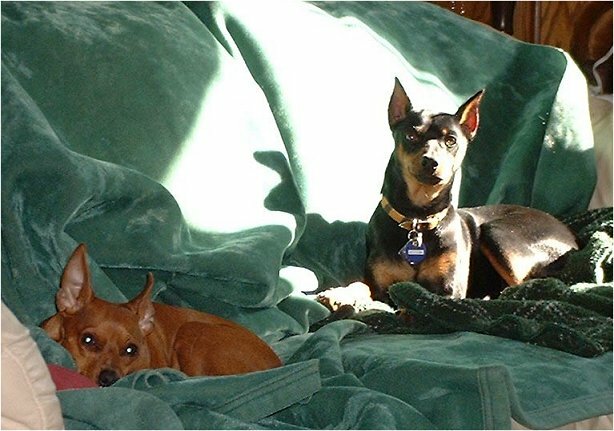 Pam and Geraldine came to us after they had contacted the Indiana shelter about a Minpin and when they arrived the next day the Minpin had been PTS (put to sleep).....after only 24 hours. They were so upset they contacted me about volunteering to stop this from happening again. So in this tragedy came two new volunteers plus a wonderful home for Simon.......Lister little buddy......you did good...... Pam N Friends"
" If you pick up a starving dog and make him prosperous, he will not bite you, that is the principal difference between a dog and man"
The next pictures are of Simon in Simon's new home with his red brother PePe'and his new brother Alvin. Simon's story has turned out to be a success and what a happy ending! 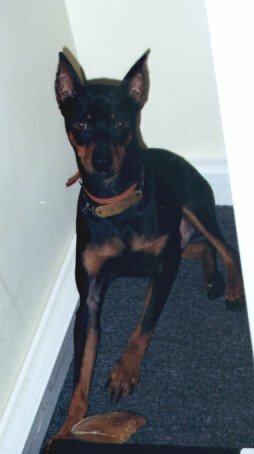 Please help this breed by becoming a volunteer or foster parent, or by adopting your own special Min-Pin baby. Visit our site IMPS by clicking HERE. Please, ALWAYS have your pet spayed or neutered to prevent abuse, neglect and unwanted pets.